Be the first to share your favorite memory, photo or story of Joy . This memorial page is dedicated for family, friends and future generations to celebrate the life of their loved one. 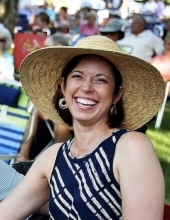 Joy Parsons Hitchcock, 46, wife of Daniel Russ Hitchcock, Pawleys Island, SC, passed away peacefully and in comfort Saturday, April 6, 2019, at her residence while surrounded by family and close friends. She fought a courageous battle against melanoma for nearly five years. While she will be deeply missed, she is now at peace and free from pain and suffering. Mrs. Hitchcock was born in Georgetown on February 3, 1973, a daughter of Sylvia Ann Hearl Parsons and the late Louis Payton Parsons of Georgetown, SC. She graduated from Georgetown High School, received a B.S. from the College of Charleston, and a Degree in Rehabilitation from the Medical University of South Carolina. Joy was a speech therapist at Tidelands Health and the Next Step Rehabilitation Center, where she was greatly loved and respected by her co-workers and all of her patients. She had a compassionate way about her, and a gracious personal touch with all of the people for whom she cared. Joy loved spending time with family and friends, most especially with her amazing and kind daughter Alice and her sweet dog Lola. She was always so happy when she was at the beach or on the water. Her sense of humor was unmatched, her laughter sincere and contagious, and she had a sparkling personality complemented by her beautiful eyes and unforgettable smile. She was a kind woman full of grace, love, strength, and spirituality. Joy was predeceased - in addition to her father - by her maternal grandparents, Richard and Virginia Hearl, and paternal grandparents, Clifford and Lucille Parsons. She was a member of the Georgetown Presbyterian Church, as were and are many generations of her extensive family. Survivors, along with her mother of Georgetown and her husband, Daniel Russ Hitchcock of Pawleys Island, are: her daughter, Alice Louise Clark of Pawleys Island, SC; her twin brother, Payton Parsons (Wendy) of Pawleys Island; a sister, Ellen P. Thames (Tim) of Columbia, SC; nieces Anna and Ashley and nephews L. P. and Mac; many cousins, aunts and uncles, a multitude of friends, and her precious dog Lola. The memorial service will be held at eleven o’clock on Thursday morning, April 11, 2019, at the Georgetown Presbyterian Church, 558 Black River Rd., Georgetown, SC. Officiants will be the Rev. Dr. Cory Ingold and close family friends Marcy and Bruce Carl. A reception will follow the service in the Church Fellowship Hall. In lieu of flowers, the family requests memorial donations to: Melanoma Research Foundation at www.melanoma.org; Georgetown Presbyterian Church Youth Ministry, 558 Black River Road, Georgetown, S. C. 29440, or to the charity of one’s choice. Along with the church, the Georgetown Chapel of Mayer Funeral Home is assisting the family in this time of loss, sorrow, and healing. To send flowers or a remembrance gift to the family of Joy Parsons Hitchcock, please visit our Tribute Store. "Email Address" would like to share the life celebration of Joy Parsons Hitchcock. Click on the "link" to go to share a favorite memory or leave a condolence message for the family.